While the Boston Cream Pie is a simple and elegant looking CAKE, there are a few things that make it cumbersome to eat. For one thing, the filling is billowy pastry cream (not firm buttercream frosting), so it tends to squish out when you cut it. This makes for a disappointing presentation. And secondly, because it isn’t frosted on the sides, the cake dries out pretty quickly. When I came across Flo Braker’s recipe, in which the whole pie/cake was constructed in a large trifle bowl, I realized a solution was at hand. Genius! Beautiful! Her presentation preserves the look of the cake and keeps the exposed sides moist. However, once you scoop out a portion and plop it on a plate, it is still kind of messy. 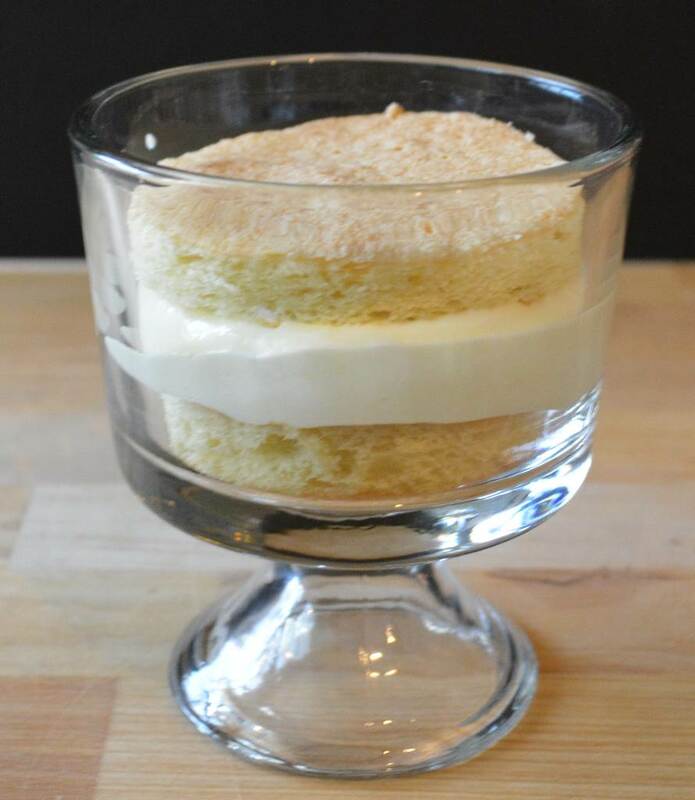 While working in restaurants, I liked to serve individual trifles in martini glasses. I cut cake into cubes and layered the cubes with pastry cream and berries — or sabayon and peaches –and topped the dessert with barely-whipped cream. It was pretty and easy to eat. 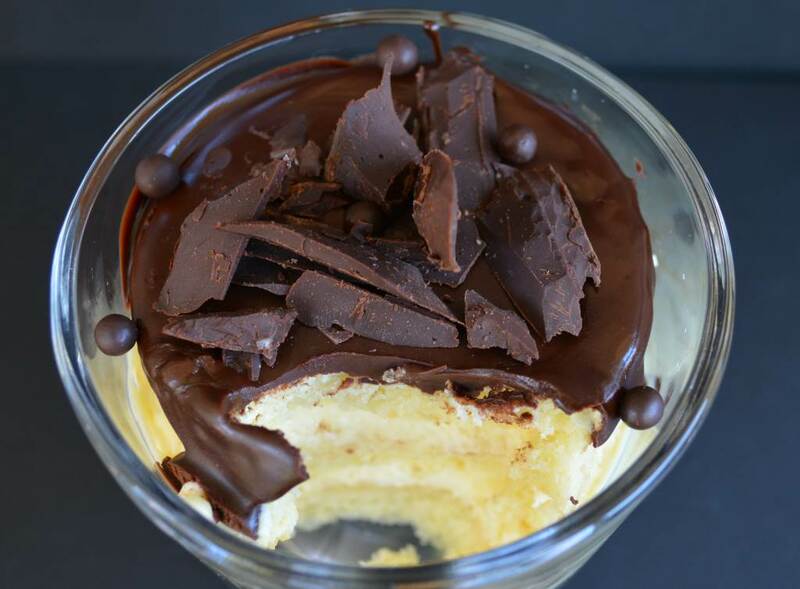 I thought of trying the same thing with Boston Cream Pie elements, but quickly decided that one of the appeals of the dessert is the distinct round layers of cake, pastry cream and chocolate. Cubed cake pieces were not going to work. So I went on a search for small, stemmed, straight sided glasses. 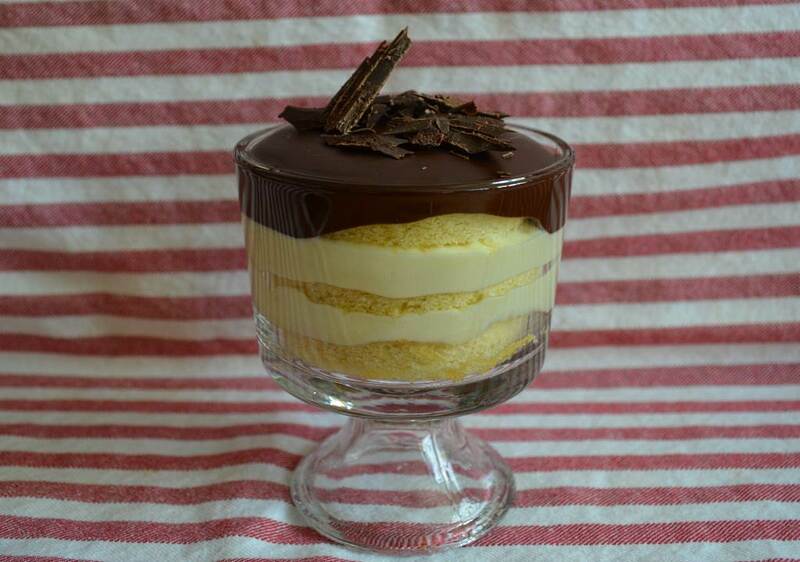 Miniature trifle bowls exist, are not hard to find, and are exactly right for this Boston Cream Pie redux. I found mine for next-to-nothing at the Crate and Barrel outlet store in my town. For this dessert I use Emily Luchetti’s “Vanilla Genoise,” which, incidentally, is not technically a genoise. 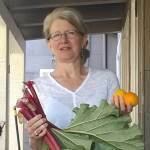 I use it for layer cakes of all sizes and shapes and for trifles. I call it Trifle Cake. It is moist, delicious, easy to cut, and an excellent cake to have in your repertoire. For the glaze, I use Flo Braker’s Chocolate Butter Glaze. The salted chocolate shard decorations are from Dorie Greenspan’s new book, Baking Chez Moi. Good team work ladies, even though I’m the only one who knows in was a group effort. Melted chocolate firming up before being cut into shards. 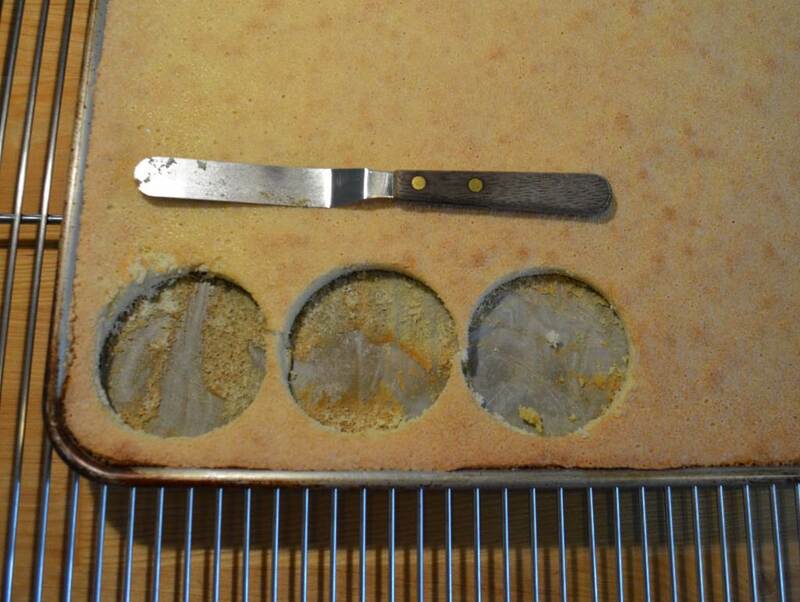 Cut rounds of cake to fit the glass or bowl in which you will be building the trifle. Be careful not to over whip cream. Gently fold together the whipped cream and pastry cream. 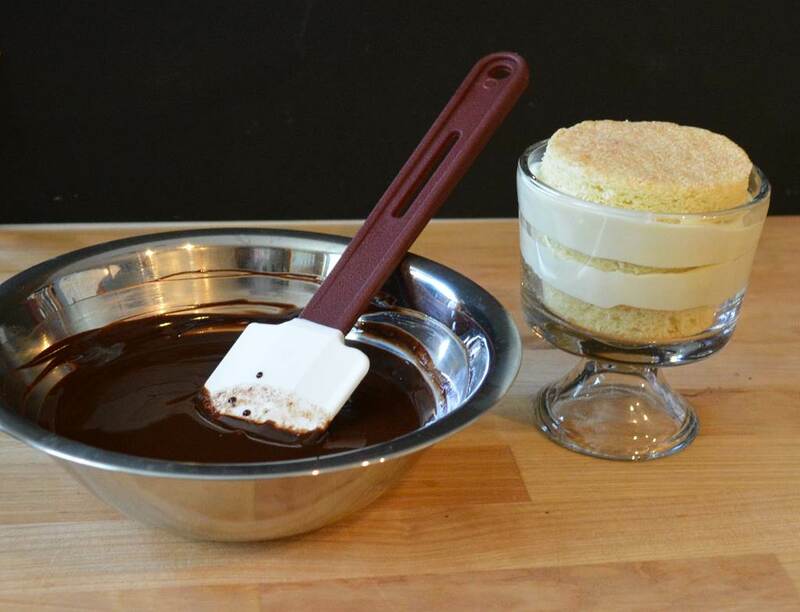 Using an ice cream scoop to portion the pastry cream into the bowl will keep the bowl neat. Keep layering until you have three layers of cake, and two layers of pastry cream. 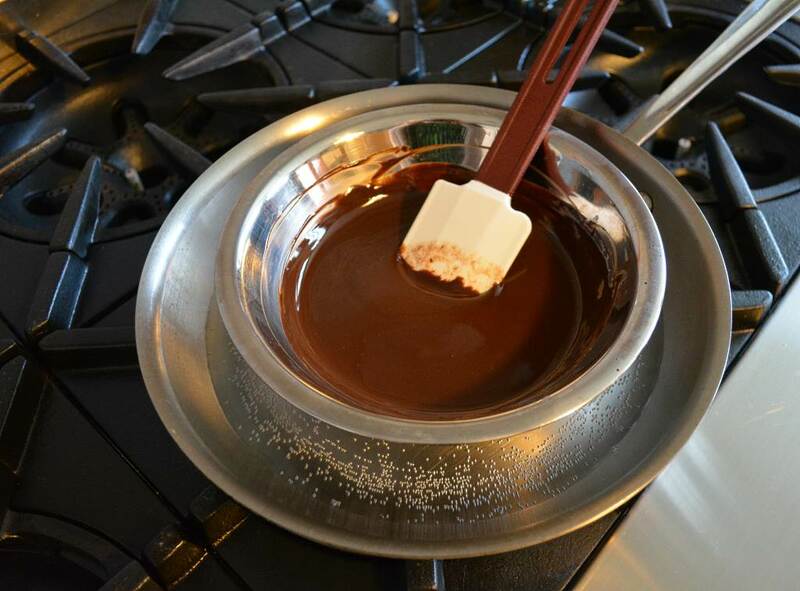 The best way to melt chocolate set in a skillet with barely simmering water. Prepare a half sheet pan by buttering the pan, lining it with parchment paper, and then buttering again. 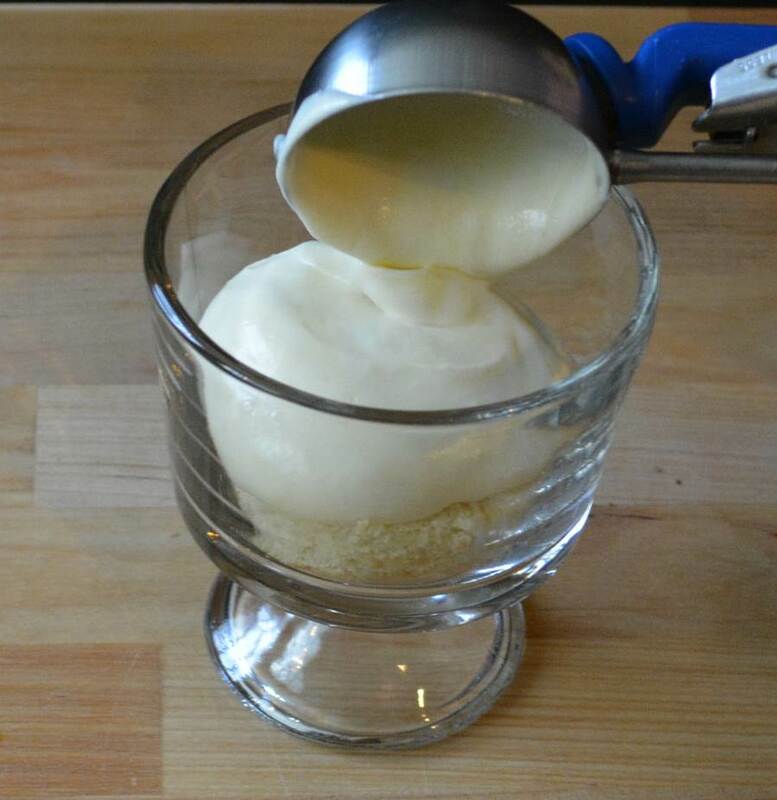 In the bowl of an electric mixer, combine the egg yolks, 1 cup of the sugar, the salt and vanilla extract. Using the whisk attachment, on high speed, whip until thick, 3 to 5 minutes. Reduce to medium speed and slowly add the hot water. Scrape down the sides of the bowl. Gradually increase to high speed and again whip until thick. Fold in the flour and then the melted butter. Set aside. Whip the egg whites until frothy. Increase to high speed and slowly add the remaining ½ cup sugar. Whip the egg whites until they have wet, shiny, medium soft peaks, and then fold them into the reserved batter. Gently spread the batter in the prepared sheet pan. Bake until the cake is golden brown and springs back lightly when touched. About 15-20 minutes. Put the milk and sugar in a saucepan and stir to combine. Bring the mixture to a simmer. In a bowl, whisk the egg yolks with the second amount of sugar until fully blended. Add the flour and whisk again until mixed. Gradually add the hot milk, stirring constantly. Pour the mixture back into the saucepan and bring to a boil, still stirring, for a couple more minutes. Remove from the stove and add the vanilla extract. Strain the pastry cream into a clean medium-sized bowl, cover with a piece of plastic wrap (or buttered waxed paper) placed directly on the surface. Cool over an ice bath, and then refrigerate. 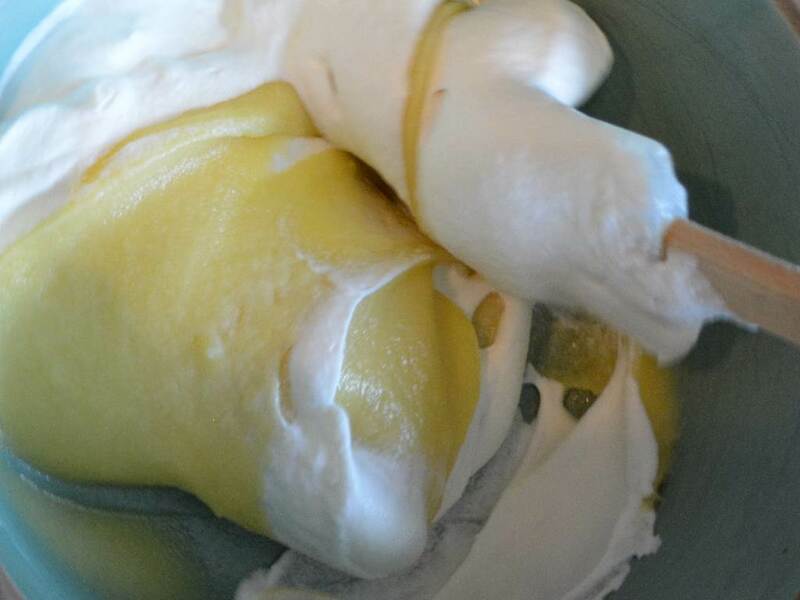 Once the pastry cream is cold, whip the cream until it forms soft peaks. Don’t over whip the cream or it won’t fold into the pastry cream evenly. Gently fold the whipped cream into the pastry cream. Chop the chocolates into small pieces. Place the butter and chocolate pieces into a bowl. Fill a skillet with an inch or two of water. Bring the water to a simmer. Place the bowl with the butter and chocolate into the skillet and once it starts to melt, stir it occasionally until it is smooth and shiny. Remove the bowl from the water. Let the glaze cool to warm room temperature. You want it to be pourable, but not too hot. If the glaze gets too stiff before you are ready to pour it, you may rewarm it over a water bath as before. Line a loaf pan with plastic wrap. 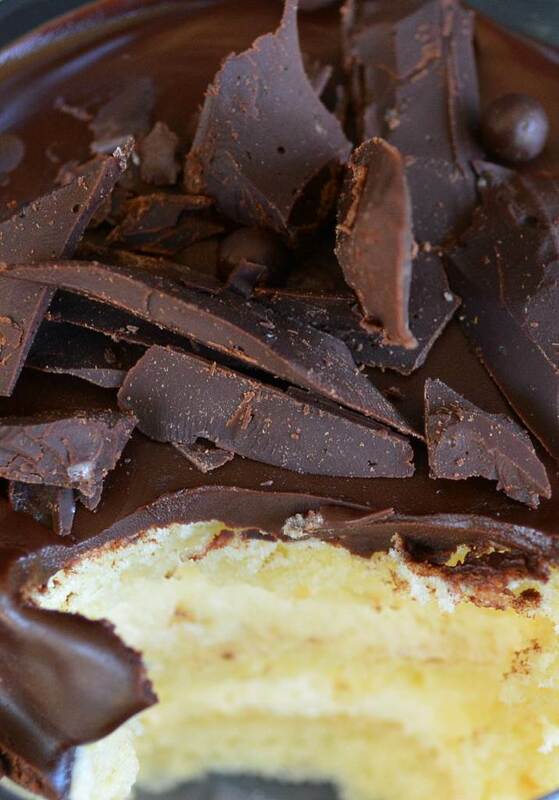 Melt the chocolate in the same way you did for the glaze. When it is completely melted, stir in the salt. 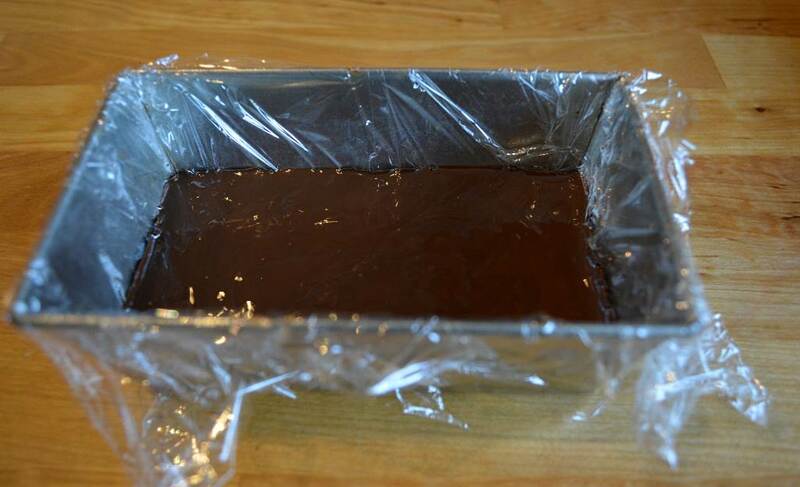 Pour the mixture into the lined loaf pan; you need a layer that is at least ½ inch thick. Freeze for 1 hour. The chocolate needs to be very cold and hard before you cut it. Remove the chocolate from the freezer, peel away the plastic wrap and put the chocolate block on a cutting board. Cut the chocolate into uneven shards of varying lengths and thicknesses. Keep in mind that the trifles are small, so the shards shouldn’t be too big. Cut cake rounds to fit the bowl you are using. Starting with a cake round, layer the pastry cream and cake until you have 3 cake layers and 2 pastry cream layers. When the glaze has cooled, but is still pourable, spoon some glaze onto the top cake layer and tilt to evenly coat the cake. Allow some of the glaze to drip over the sides. 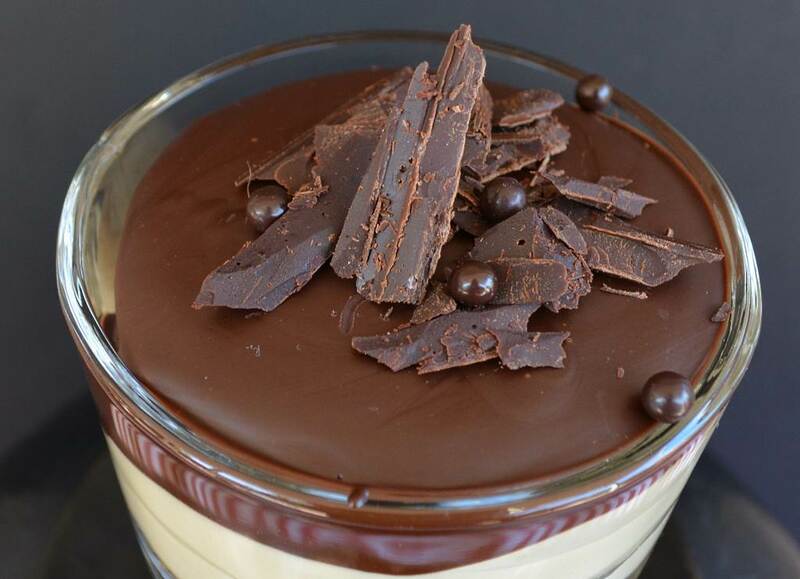 Decorate with the salty chocolate shards and any other chocolate decorations that suit your fancy. The trifle is best served at cool room temperature. If the trifle has been in the refrigerator long enough to harden the glaze, bring it out of the fridge to warm up before eating. Thanks, Joyce! Would love to hear how you like it. Oh My! It’s got looks, class, ingenuity, a kind of undeniable seduction! May have a piece right now please??? Thanks, Mom, I’ll make you one when I get home.